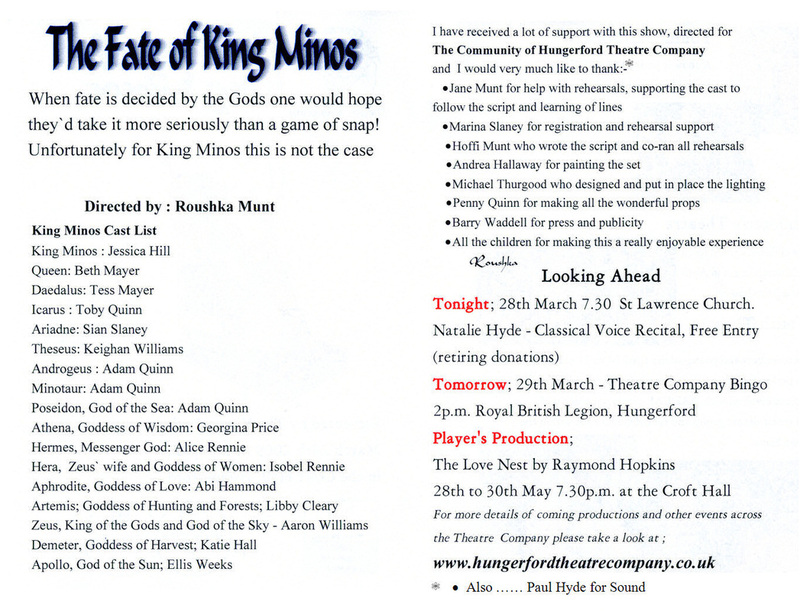 The performance on Saturday 29th March delighted a large audience at the Croft Hall Hungerford. When fate is decided by the gods one would hope they’d take it more seriously than a game of snap. Unfortunately for King Minos this is not the case. King Minos, with help from the famous inventor, Daedalus, built a great Labyrinth below Crete to house the frightening Minotaur. Every year Athenian’s were sent to feed the Monster. One year the hero Theseus was sent to be devoured but instead he defeated the beast and, after being instructed by Daedalus and Ariadne, King Minos’ daughter, was able to escape the labyrinth. When Minos discovered that Daedalus had helped he locked Daedalus and his son, Icarus in the tallest tower but Daedalus cleverly built two pairs of wings so he and Icarus were able to fly away. However, Icarus flew too close to the sun and the wax, which held the wings together, melted, and he fell into the sea. Daedalus avenges his son’s death by finally overpowering King Minos and he is finally free.